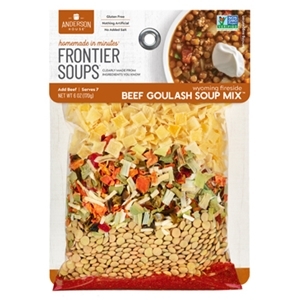 Frontier Wyoming Fireside Beef Goulash Soup ia s quickie version of hearty, peppery goulash prepared with ground beef. This new Homemade in Minutes soup makes a rustic meal in about 45 minutes. In a 4 quart pot heat oil over medium high heat. Crumble and brown ground beef. Add soup mix and stir for 1 minute. Add broth, bring to a simmer and cover for 35 minutes. Stir in tomatoes and Worcestershire, cover and continue to simmer for 15 minutes. Serve in bowls with sour cream on top. Option 1: Serve on top of cooked wide egg noodles for a classic eastern European dish. Option 2: For a soupier version that will serve more people, add 1 bottle beer and serve with crusty whole grain bread. Green lentils, potato, red and green bell pepper, carrot, onion, leek, paprika, carroway seed, marjoram and thyme. No added salt, preservatives or MSG.